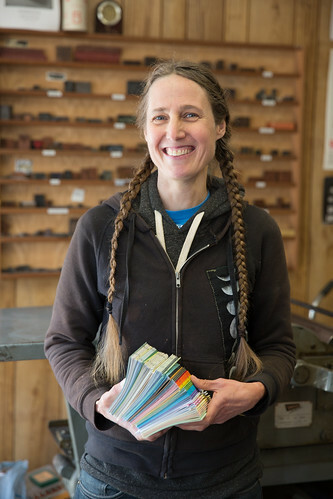 ​Deep Ink Letterpress is a letterpress shop in Berkeley, California, owned and operated by Karen Switzer. The main workhorse in the shop is a Vandercook Model 4, and Karen uses handset metal and wood type as well as polymer plates, when appropriate. Karen has been letterpress printing since 1994 and has been working in the handmade greeting card industry for nearly that entire time. She started Deep Ink Letterpress in 2007 when she temporarily relocated to Pittsburgh, Pennsylvania and bought a Chandler & Price platen press. Moving back to her home state of California in 2014, she added a wholesale greeting card component to her business to complement her custom invitation work. Deep Ink Letterpress is available for custom letterpress stationery and invitations, although the bread and butter of this operation is the wholesale division of greeting cards for fine gift and book shops.